ExamSoft’s education software provides unmatched support for faculty, staff, and administration with a comprehensive solution to manage and optimize student assessments. It’s an invaluable platform for students as well, enhancing their academic experience in a number of ways from individual student performance evaluation to providing a more secure testing environment. Through ExamSoft, educators can change the way they create, manage, and analyze assessments to have a significantly greater impact on student performance and retention. Upon completing an exam, students can be given in-depth performance data outlining strengths and weaknesses. This performance data can help students improve self-directed learning efforts, so they can manage study time efficiently and focus more on areas that need immediate improvement. In the same respect, the timeliness of a student performance evaluation is often paramount because students require feedback that will be relevant to their future academic success. ExamSoft provides a way for educators to instantly score performance assessments in order to provide the necessary feedback as quickly as possible. The ability to tag assessment items to specific topics (“categories”), with the option to set and identify “at risk” thresholds, students can be given a clear view of their performance, within a course or throughout the curriculum as a whole. The ability to aggregate this data to track how students perform can prove vital to their success. Mapping individual test items and performance assessments to accreditation standards, course objectives, or similar topics allows instructors in our programs to provide direct, timely feedback to students about their strengths and opportunities for learning. The ability to also aggregate that data for students to see how they perform in an area over an entire course, semester, or program is invaluable to their long-term growth. The rubrics feature in ExamSoft is incredibly easy to use and efficient; but more importantly, using it to score written essays and performance assessments (laboratory practical exams, clinical skills, simulated experiences) provides opportunities for instructors to instantly score experiences, provide detailed feedback to students in a visual platform, and see trends in performance over time or by student group that paper rubrics just don’t easily facilitate. Security is also essential when dealing with computer-based testing and education software. With ExamSoft, students can take a formative assessment or summative assessment on a platform that locks down their entire device. That way there is no access to the internet, no ability to upload screenshots of test questions, or communicate through instant messengers. Now students can take their assessments in a secure and fair testing environment, which ensures exam integrity remains intact. 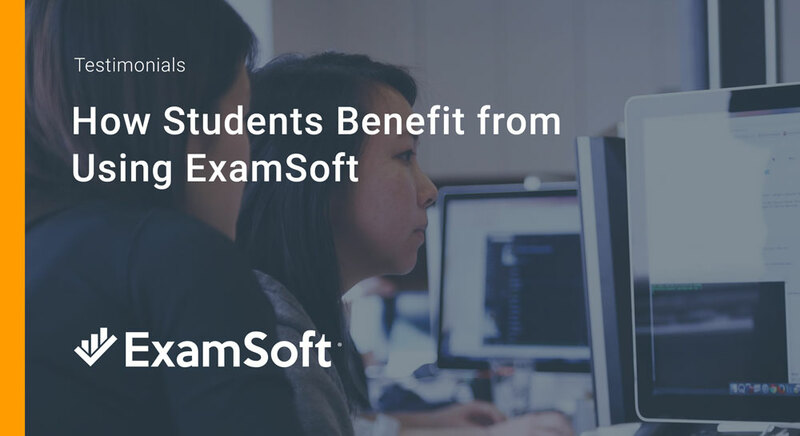 ExamSoft locks down a device, effectively minimizing distractions and forms of academic dishonesty, and the education software does not require a Wi-Fi connection. The secure software features military-grade encryption that works offline, so there will never be a connectivity issue because of poor Wi-Fi signal. As an extra precaution, the student’s testing progress is also secured in real-time, should there be a case of general device failure or unexpected shutdown/reboot. This allows the students to focus on just the assessment and not the technology. ExamSoft is the trusted solution to give students the secure, reliable platform they need to put themselves in the best position for academic success. By providing a computer-based testing platform that is secure, offline, and distraction-free, students can focus on the content of the assessment at hand and not the technology used to deliver it. For more information about how ExamSoft can help you achieve programmatic success, schedule a demo today. How Good Are Your Exam Questions?